Capablanca Chess starting setup. The archbishops are on c1/c8; the chancellors are on h1/h8. Capablanca Chess (or Capablanca's Chess) is a chess variant invented in the 1920s by former World Chess Champion José Raúl Capablanca. It incorporates two new pieces and is played on a 10×8 board. Capablanca believed that chess would be played out in a few decades (meaning games between grandmasters would always end in draws). This threat of "draw death" for chess was his main motivation for creating a more complex version of the game. The archbishop combines powers of a bishop and a knight. The chancellor combines powers of a rook and a knight. The new pieces allow new strategies and possibilities that change the game. For example, the archbishop by itself can checkmate a lone king in the corner (when placed diagonally with one square in-between). Capablanca proposed two opening setups for Capablanca Chess. His final revision placed the archbishop between the queen's knight and queen's bishop; the chancellor between the king's knight and king's bishop. The king moves three squares when castling instead of moving two squares as in standard chess. A pawn can promote to archbishop or chancellor in addition to the regular promotion options in standard chess. ... I played many test games with Capablanca, and they rarely lasted more than twenty or twenty-five moves. We tried boards of 10×10 squares and 10×8 squares, and we concluded that the latter was preferable because hand-to-hand fights start earlier on it. Lasker was one of the few supporters. Hungarian grandmaster Géza Maróczy also played some games with Capablanca (who got the better of him). British champion William Winter thought that there were too many strong pieces, making the minor pieces less relevant. The new piece names archbishop (originally named chancellor) and chancellor (originally named marshall, followed by marshal) were introduced by Capablanca himself. These names are still used in most modern variants of Capablanca Chess. Carrera's Chess. Earliest chess variant on 8×10 board with archbishop and chancellor. Capablanca was not the first person to add the archbishop and the chancellor to the normal chess set, though he is the most famous. Other attempts mostly differ only by the arrangement of pieces and the castling rules. In 1617, Pietro Carrera published a book Il Gioco degli Scacchi, which contained a description of a chess variant played on an 8×10 board. He placed new pieces between a rook and a knight. Archbishop was on the queenside and chancellor on the kingside. Carrera used names centaur instead of archbishop, and champion instead of chancellor. The game was largely forgotten after the death of the inventor. In 1874, Henry Bird proposed a chess variant similar to Carrera's variant. The only significant difference was the opening setup (the same as Capablanca Chess). Bird used the names equerry instead of archbishop, and guard instead of chancellor. The opening setups for Aberg's variation (8), Grotesque chess (7), Univers chess (6), Ladorean chess (5), Embassy chess (4), Gothic chess (3), Schoolbook chess (2), and Paulovich's variation (1). All are displayed from white's point of view of the board. Embassy Chess uses a starting position identical to Grand Chess adapted to a 10×8 board. Capablanca Random Chess combines ideas of Fischer Random Chess and Capablanca Chess. It also applies the principle which demands that all pawns in the starting positions are protected by at least one piece. Grand Chess starting setup. The chancellors are on f2/f9; the archbishops are on g2/g9. There are also variants of Capablanca Chess that do not use the standard 10×8 board. Grand Chess is a popular variant invented by Dutch game designer Christian Freeling in 1984. It uses Capablanca Chess pieces upon a larger, 10×10 board. In 2007 Grandmaster Yasser Seirawan devised a variant (called Seirawan chess), which adds the two pieces to the standard game in a different manner. 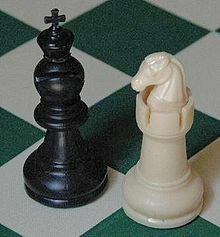 The player, after moving a piece (for example, a bishop) from the first rank, may immediately place either of the two pieces on the bishop's square. If the player moves all his eight starting pieces without placing the hawk or the elephant (Seirawan's names for the archbishop and the chancellor, respectively), he forfeits his right to do so. Gollon, John (1968). "Capablanca's Chess". Chess Variations • Ancient, Regional, and Modern. Charles E. Tuttle Company Inc. pp. 219–22. LCCN 06811975. Lasker, Edward (1959). The Adventure of Chess. ISBN 0-486-20510-X. Pritchard, D. B. (2007). Beasley, John, ed. The Classified Encyclopedia of Chess Variants. John Beasley. ISBN 978-0-9555168-0-1. Schmittberger, R. Wayne (1992). New Rules for Classic Games. John Wiley & Sons Inc. ISBN 978-0471536215. This page was last edited on 21 January 2019, at 17:06 (UTC).